Hanukkah offers the perfect opportunity to give a present that will last a lifetime: the gift of positivity and happiness. While it may be customary to give gadgets and toys, studies show these types of presents do not actually raise a person’s level of joy and happiness. Material gifts may boost positive emotions, but only temporarily. A more permanent gift would be to teach and identify one’s signature character strengths. Studies on wellbeing and life satisfaction show that people who know their strengths and maximize them are happier than those who do not. Knowing your signature strengths are a step towards living the best version of yourself. Judah Maccabee displayed his signature strengths (bravery, optimism, perseverance, resilience, and leadership) and became the hero of the Hanukkah Story. His strengths were heroic but not everyone can be a hero. Those with different strengths might fail miserably if they were expected to act like a brave leader. They would be unhappy, people around them would suffer, and in some cases, history would turn out very differently. 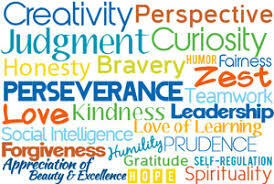 Understanding your signature character strengths on a deep level is your key to thriving and flourishing in your life. That’s why it’s the best Hanukkah gift ever. Here’s your Positive Judaism gift guide to wellbeing and happiness that you can do at once or over eight nights – individually or as a group experience with your family and friends. One: Tell the Story of Hanukkah and explore Judah Maccabee’s character strengths in conversation. Two: Acknowledge that Judah Maccabee had a set of strengths that were unique to him, but that everyone has different strengths. Download and read the Character Strengths Inventory. Three: Return to the idea that everyone has unique signature strengths. With the Strengths Inventory in hand, consider what you think your signature strengths are and why. Five: Review with yourself and your friends the results of your survey and your own set of personal signature strengths. Six: With the results of your Signature Strengths in hand, how could your life be improved if you focused on living your Signature Strengths? Seven: In the story of Hanukkah, the ancient Israelites rededicated their Temple and their lives to Judaism. If you are not living your strengths today, how could your wellbeing and happiness grow if you dedicated your life to making them central to your life? Eight: What changes do you need to make to embrace your signature strengths for a happier and better version of yourself? Write them down and dedicated yourself to them!